Our screening room also has the ability to be transformed into an attractive cinema space to hire. Located just above our understated yet memorable Cellar Bar, our newly-built cinema has a capacity of 52 when fitted with our reclaimed vintage theatre seats, is equipped with high-end HD projector system as well as Dolby surround sound for a highly professional, cinema quality screening experience. To date, it has been the main venue for our most recent venture, TT Cinema, and so has proven its viability by playing host to a number of branded screenings of cult classics. Capacity: 52 persons (100 standing). Retro aesthetic with tiered seating. Epsom Full HD3D & 1080p ready projector system. 5.1 Surround Sound, Monitor Audio speaker set-up. Wireless connection to Panasonic DMP UB200 UHD Blu-Ray/DVD player & Onkyo TX-NR 676 amplifier. Microphone also available on request. Coffee, tea and water can be provided. Available to hire by the hour, day or half-day. Through the swinging saloon doors of the liquor store and up through our atmospheric Lounge Bar, we have our screening room. It has played host to a wide variety of events from music video premieres to after-work talks. 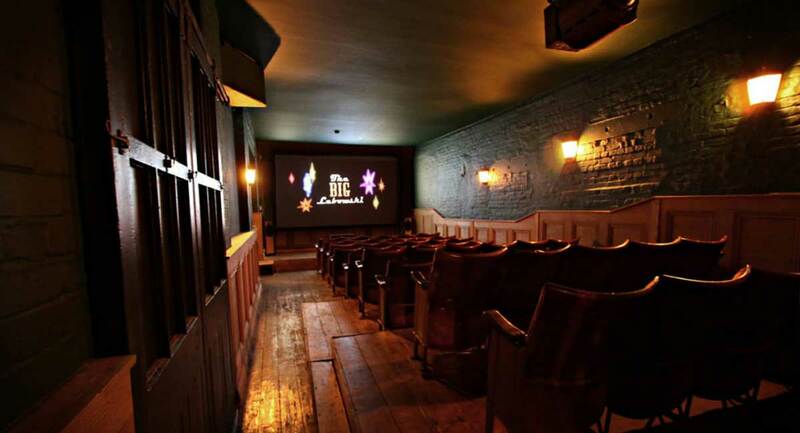 Most recently it has been converted into a theatre space as part of our latest venture, TT Cinema, which entails us putting on a screening of a cult classic every month and pairing it off with a classic cocktail. 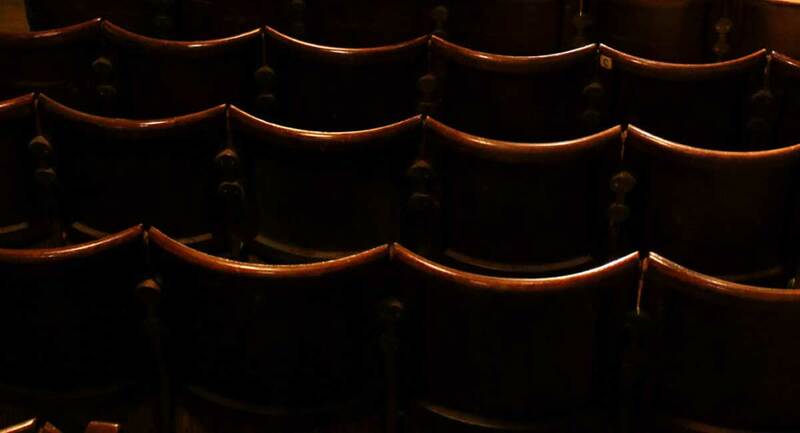 The decor is in tune with the rest of the building, and the space boasts oak-panelled walls, low-hanging lanterns throwing out atmospheric orange hues, and row upon row of reclaimed vintage cinema seats that were recovered from a derelict Welsh provincial theatre. These quirky touches are paired off nicely with modern, up-to-date technological fittings such as HD projection, Dolby surround sound, and a cinema-quality projector screen to ensure attendee’s viewing experience is as professional and seamless as possible. Furthermore, its location, right next door to our Lounge Bar, and perched just above our intimate Cellar Bar, means that liquid refreshments will never be too far from attendee’s hands. On top of this, our liquor store – and therefore our well-stocked shelves of beer and wine – is mere meters away, meaning that everyone should be well-and-truly catered for. On top of this (literally) you will find our fully-equipped kitchen and West Wing banqueting space, opening up the possibility of incorporating food pairings in a building-wide event. As always, our team of experienced event organisers are based on-site meaning that they will be on-hand to talk through any aspect of your event – on the day or otherwise. “The Cinema’s great! It’s a really good place to have either presentations in for work, or to come by with a group of friends and watch a movie. Our cinema club’s been doing really well over the past few months – plus it’s really nice to sip on a drink while you watch. Perfect!” – Lucy, Event Organiser. The screening room is one of our most popular rooms, and it has played host to a wide variety of events. In the short time since we unveiled the space in March 2018, we’ve hosted music video premieres, company presentations, after work talks, lectures, film-and-supper clubs, and more in the space. More recently we’ve also been hosting monthly film nights as part of TT Cinema, so you could say that the Cinema Room has a proven track record in hosting high-quality multi-sensory events.